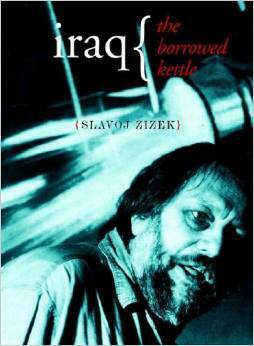 I’ve lately been reading a book by the Slovenian philosopher Slavoj Žižek called Iraq: The Borrowed Kettle. It’s a good book, in which Žižek sums up his immediate reactions to the American invasion of Iraq in six short essays of sort, followed by longer appendices and reflexions. I’m a partisan of many of Žižek’s ideas, and am familiar with his books, but also with his interviews and conferences: he’s a very interesting, thought-provoking – and entertaining – speaker. Here is a video for those who do not know him and who would like a short exposure to his particular manner of his speaking (it’s also a good example of how his insightful observations can be simultaneously brilliant and funny). Iraq: The Borrowed Kettle was published in 2004, shortly after the American invasion, and was therefore still very “fresh” in its analysis, and, in a way, in its relevance. I found it interesting to read for the added benefit of hindsight. I was curious as to how he saw the situation unfolding in the long run, and was left impressed by his predictions. I’m going to mention a few key moments for me in the book, but the main reason I’m mentioning it here at all has nothing to do with Iraq, as you shall soon see. This echoes many conspiracy-theory-sounding explanations frequently heard in Lebanon and elsewhere, about America’s plans of re-organizing the entire region; the Kissinger plan; about America’s involvement in creating ISIS; and many, much more horrifying stories. I am often really annoyed by the propensity for such fantasy in the common Lebanese. In Lebanon, people watch “predictions” on New Year’s Eve, made by buffoons who take themselves much too seriously, “reading” the future. Let’s be direct: either you think these people are actually having visions, in which case you need to wake up, and get your sanity checked; or you think these people are analysts of sorts, who choose to use their skills and understanding of society to “predict” what will happen, like a Lotto – in which case they should be held accountable for their predictions. They would be much more useful to people by discussing the reasons for their predictions, encouraging people to think and understand the situation, rather than pretending like their speculations came to them from above. Why people care for these things will always remain a bit of a mystery for me; but it must have something to do with people’s inclination for idiotically repeating conspiracy theories. It’s as though we have such a difficult position in History and in our everyday life that the only way we can console ourselves for it is by making up insane explanations that imply that the horror we live through is someone else’s doing. That it all makes sense. It often does, but let me clearly state my own opinion: most of the time, what happens to us is our own fault. We get – close to exactly – what we deserve. Still, on the general subject of conspiracy theories, I think that it’s a genre actively developed and maintained by people in power in order to create a new category in people’s minds. A pavlovian-reflex of sorts. Whenever someone ventures to think outside the box (and this mostly happens in the West), they are quickly dismissed as crazy and as conspiracy-theorists. I’m not saying those people (real crazies) do not exist, but I am saying that their number is far smaller than the number of people who get accused of telling these stories. In Lebanon, we have the reverse problem. Way too many people tell such stories, to the point that you don’t even know what’s true and what isn’t. You find yourself trapped between being an idiot and being naive, and you’re not sure what to believe anymore. In that sense, reading Žižek’s above-mentioned quote comforted me, because I thoroughly trust his intelligence, his thoroughness, his integrity – and his sanity. But there was something else, and that’s the reason I’m writing this entire post. The Lebanese francophone newspaper L’Orient-le-Jour frequently publishes stories that bear “positive news”. As they describe the purpose of this section: in a context of corruption, infrastructural problems, political problems, and so on, the editors strive to regularly find positive stories to offer their readership, as a touching effort to balance things out. These stories generally range from inspirational personal stories to ambitious projects undertaken somewhere in the country, and more. I don’t believe I need to comment on this and spell things out, as the parallels between this story and, for example, the Lebanese context are apparent. What if we just need to hope more? What if we just have to try, sometimes, and take a leap of faith? What if we stopped listening to the people who threaten all of us? What if we stopped giving in? Because the majority of us are non-violent. The majority of us don’t care. We just want to live our lives, work, go to the beach, eat, dance… But we all constantly hold our breaths, and keep quiet in the face of threats. In fact, many of us actively defend the status quo. What if we took that leap of faith, as Croatia did? What if we started trying to do the right thing, and hope for the best? Hope that things work out?